A femur cross-section, along with other living bones, consists of three layers: the periosteum, or outside skin of the bone; the hard compact bone; and the bone marrow. The femur is the thigh bone, the longest bone in the body. If we were to cut the femur bone in half, we would see that it contains various layers. First is a layer of thin, whitish skin that is packed with nerves and blood vessels and supplies the cells of which the hard bone below is built. Next is a dense, rigid bone called the compact bone. It is shaped like a cylinder and is so hard that surgeons must use a saw to cut through it. It is honeycombed with thousands of tiny holes and passageways, through which run nerves and blood vessels that supply oxygen and nutrients to the bone. This dense layer supports the weight of the body and is made up of mostly calcium and minerals, so that it feels no pain. The skin, however, is very sensitive, so that when a bone is broken, injured nerve fibers run through the compact bone and send messages that relay the pain signals to the brain. 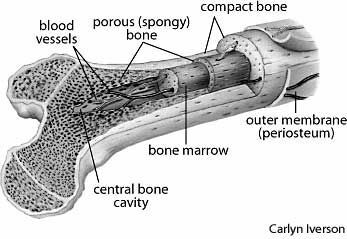 If we cut though the compact bone, we find that its cylinder surrounds and protects the spongy bone marrow, which contains a material much like gelatin. This cylinder is the medullary cavity, and is the central cavity of bone shafts. It is where yellow bone marrow (or adipose) is produced and stored. In infants, the marrow is red because blood cell formation is taking place within these cavities. This marrow produces red blood cells (which carry oxygen), white blood cells (which fight infection), or platelets (that help stop bleeding). These three bone layers work together with nerve signals that speed back and forth and blood streams that move between the layers. Thigh bones are usually stronger, pound for pound, than reinforced concrete. An epiphyseal line refers to a strip of relatively less dense bone found in the long bones.